Base Notes: patchouli, amber, musk An aromatic woody scent with black pepper, juniper berry and lavender, freshened by green bergamot and Sicilian lemon. An undertone of amber, patchouli, and musk add a sensual warmth and dark edge. Beautifully boxed; 100ml natural spray. Made in England. King's Road, Chelsea - Spring 1976. 'A memory from my early 20s, feeling a great sense of empowerment living in my first apartment, alone yet surrounded by life. Overlooking a hive of energy and evolution'. 1976 Eau de Parfum is a fragrance of juxtaposition in an era of light and shade. A fragrance of youth, where light and energy were born from a period of change in the late 20th century. A positive outlook from a generation claiming London for their own. Fashion, art, music and culture created a hub of style. An aromatic woody scent with black pepper, juniper berry and lavender, freshened by green bergamot and Sicilian lemon. An undertone of amber, patchouli, and musk add a sensual warmth and dark edge. 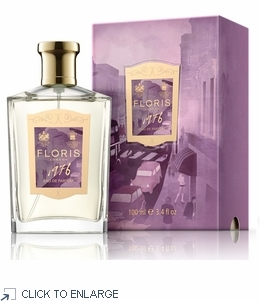 FROM THE FRAGRANCE JOURNALS COLLECTION: The Fragrance Journals are a series of three unique Eau de Parfums, capturing the heart and soul of London throughout the decades of the 1960s, 1970s and 1980s. Each fragrance weaves and knits its way through the fabric of a key moment, district, and culture of the time, bringing out a true reflection of a city which has the ability to both adapt to change, yet remain rooted in its identity. A love letter to London, its social fabric and its people. An aromatic woody scent with black pepper, juniper berry and lavender, freshened by green bergamot and Sicilian lemon. An undertone of amber, patchouli, and musk add a sensual warmth and dark edge. King's Road, Chelsea - Spring 1976. 'A memory from my early 20s, feeling a great sense of empowerment living in my first apartment, alone yet surrounded by life. Overlooking a hive of energy and evolution'.